The two-port Smarthub brings WeDo 2.0 sensors and motors to life. 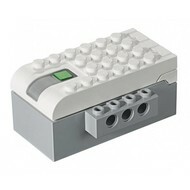 Using WeDo 2.0 Software and Bluetooth Low Energy (BLE), the Smarthub transmits data between a tablet or computer and the WeDo 2.0 Construction Set. Require two AA batteries or a Smarthub Rechargeable Battery.